Custom copper kitchen centers from Handcrafted Metal can be made almost any size you need. Kitchen centers offer a comfortably large space to clean, cut, and drain water. Every feature can be customized, including the number, shape, and size of the bowls. Choose from additional features such as woven aprons and towel bars to further personalize your sink. Each piece is fully welded and polished, and made with the purest copper available. Also, each sink has coved corners inside for easy cleaning, and can be made with drop-in mount, under mount, or flush mount rims. Click on any sink below to see more pictures, and customize it according to your specifications! 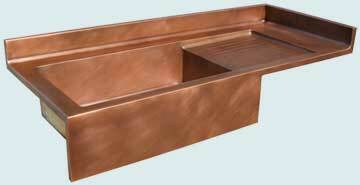 This superb copper kitchen center with sink and drainboards will take center stage in your kitchen. The ribbed drainboards provide generous space for dishes. The splash protects the wall behind. The extended apron gives prominence to the sink. All welded 16 gauge copper, smooth metal.